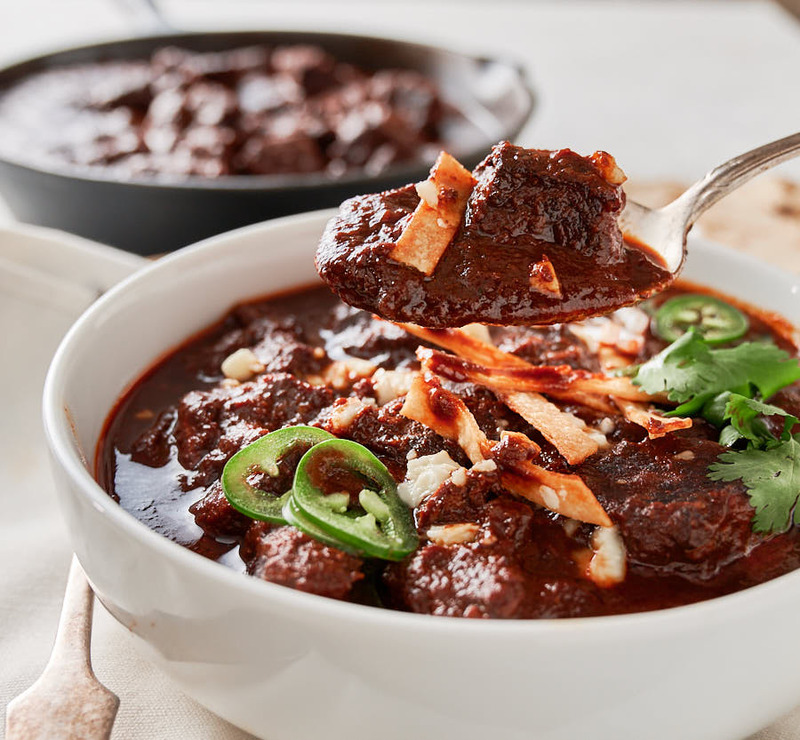 The best beef chili of all time is a bold statement. You may disagree. But once you taste I think you’ll change your mind. It’s that good. It has nothing to do with the state of Colorado. I’m sure they make great chili there. But this is Mexican. Colorado means red colour. It’s not really red though. More of a deep brick. The colour of chilies. Don’t let the amount of chilies in this recipe put you off. It’s not that spicy. Ancho and New Mexican chilies are pretty mild. More chilies means more depth of flavour. More intensity. Chili should be about the taste of chilies after all. For me anyway. 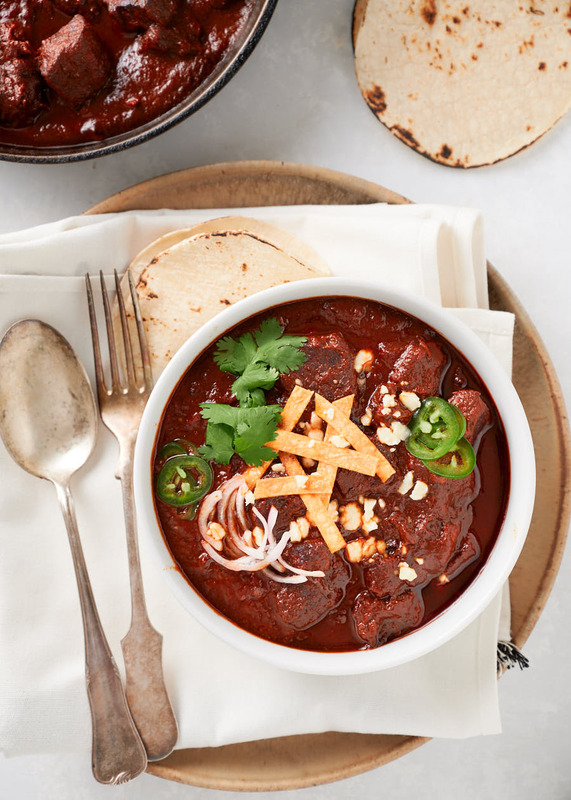 What you get is this crazy delicious Mexican stew. The beef may be the backbone but the chilies are what makes it sing. It’s not like anything else out there. If you are looking for some magic ingredient that makes this work it doesn’t exist. There’s no beer in this recipe. No chocolate. Or coffee. There are no beans. No wine. No cinnamon. Barely any spice beyond the chilies. This is pure chile flavour wrapped around chunks of good beef stew. Some fire-roasted tomatoes. Onions and garlic. That’s it. This is about technique really. There are some steps that may seem strange to you. But that’s what it takes. How it works. I make other chili dishes. Sometimes I add some pork with the ground beef. Tons of chili powder. Whole de Arbol chilies. 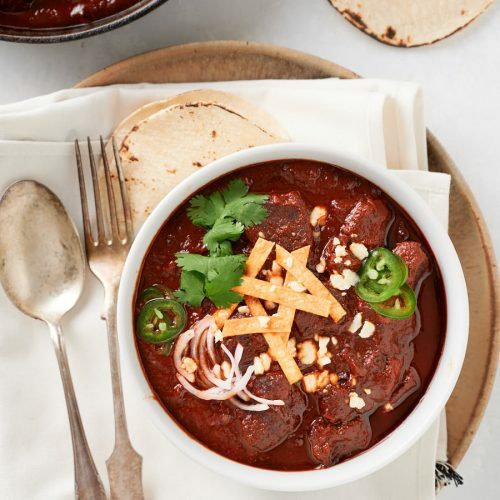 Tasty but nowhere as good as chile colorado. This is my go to. I make it when I want to blow people away. When I enter a chili cook-off. When I want to win. There are not a whole lot of ingredients here. So your chilies matter. They are the star. Along with the beef. So make sure you use good quality dried chilies. I use a mix of New Mexican and ancho chilies. More ancho than New Mexican. But that’s not a rule. Its a guideline. Go with your gut. Or what you can get. Anchos are the backbone though. So try to keep them in your mix. Toast your chilies before you rehydrate them. It’s a simple thing. But it makes a difference. Just a few seconds on each side. Two or three at a time. So you don’t burn them. Maybe two minutes of your time. Worth it. Do it. This may be a bit different from what you are used to. But it adds a little something magic. Dry roast the onions, garlic and jalapeños. Toss them into a dry cast iron skillet and char them a bit. Keep the garlic and jalapeños moving to cook fairly evenly. You are going for brown here. Not black. So don’t go overboard. Medium heat. Patience. But you do want colour so don’t stop too soon. The garlic will be done first. It will have little dark brown spots. The jalapeños come off next. Blistered and softened. The onions take the longest. Check them. Once they are lightly charred on one side flip them. They are done when they soften. Not mush mind you. Soft. I picked this trick up from Mark Miller’s Coyote Cafe cookbook and it’s a good one. Fy the chile paste in the oil you cooked the beef in. Or better yet, add a bit of pork lard. Seems simple enough but it makes a huge difference. Taste the chile paste before and after. You’ll see why you need to do it. Raw, the chile paste is a bit bitter. All sorts of hard edges to the flavour. After it’s fried it’s smooth and round tasting. It’s a little bit of cooking magic. I’ve held back publishing this recipe for a couple years now. Didn’t really want to share. It’s my killer chili after all. This is the one I pull out when I want to show off. Chile colorado. 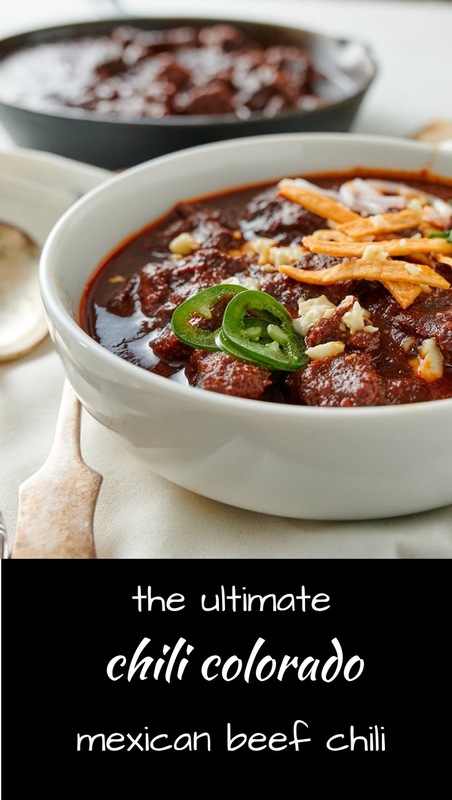 It may be the best chili you ever taste. My favourite for sure. Hope it becomes yours. 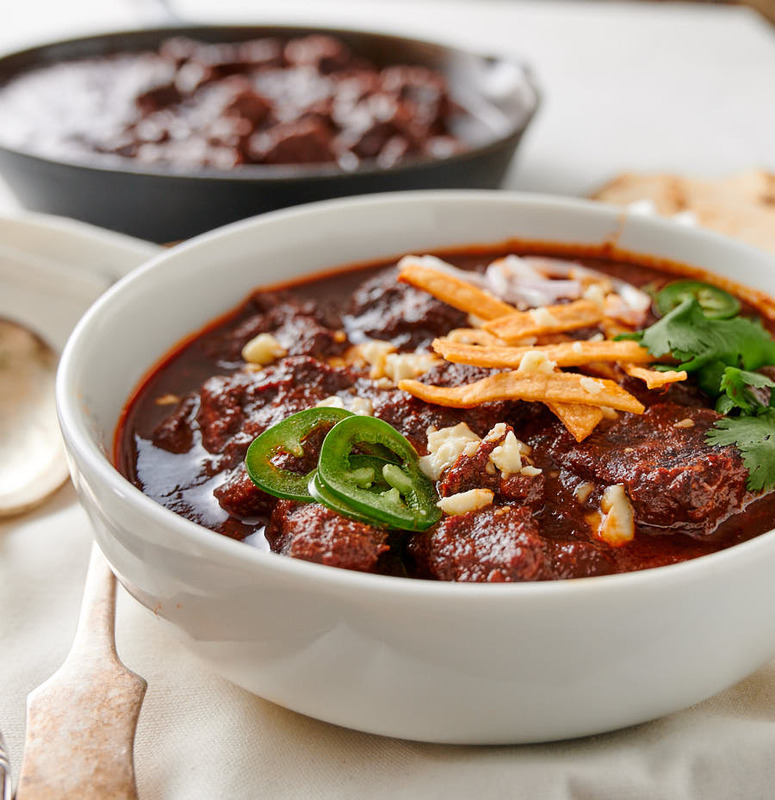 Named for the colour red, chile colorado is beef chili like no other. Place the chilies in a heat proof bowl. Pour boiling water overtop to completely submerge. Extra water is OK.
Let stand 30-40 minutes until fully rehydrated. Tear the chilies open and remove the seeds. Dipping them into the chile water to rinse them off works well. Set aside. Heat a cast iron frying pan or comal over medium heat. Peel the onion. Cut it into 3 slices (around 3/4 inch thick). You want rings showing. Cut it that way. Place whole onion slices, garlic and jalapeños in the frying pan and dry roast until brown one one side. Flip and continue roasting. You are done when they are soft. For the garlic and jalapeños keep moving them around. You want some char and blistering on the jalapeños. Not everything will be done at the same time. Garlic will be done first. Then jalapeños. And then onions. Place tomatoes and their juices, a splash of water, chilies, onions, garlic and jalapeños in a blender or large food processor. Add the cumin, Mexican oregano (if you have some) and salt. You want the wet ingredients at the bottom. Puree. Really puree. You are going to have to strain this. If your blender fights you add a bit more water. You will get there. Straining the chile paste is a pain. A real pain. But it's worth it. So do it. Skipping this step means you will be spitting out bits of chile skin. Not good. Use a strainer with fairly big holes. A super fine strainer is pretty much mission impossible. You should get about 4 cups. Maybe more depending how much water you added. You want to brown the beef. You don't want to boil it. So do not overcrowd your pot. You don't want pieces touching. Trust me. If you see water forming in your pot you have overcrowded your pot. These are words to live by. Any time you make stew. Pre-heat a sturdy pot over medium heat. Salt your beef. Film the bottom of the pot generously with oil. Add the beef and cook, turning occasionally until well browned. Remove and set aside. Repeat, adding oil as necessary until all the beef is browned. I used a big pot and I did this in 4 batches. There should be a wonderful fond (brown bits) and some oil in the bottom of the pan. Your stove should be a mess. That's how you know you did it right. Frying your chile paste is the step that makes this dish what it is. Don't skip it. Your pot should still be hot. If not heat it up again. If there isn't a good film of oil in the bottom add a bit more. Pour the strained chile paste into the pot. It will bump. 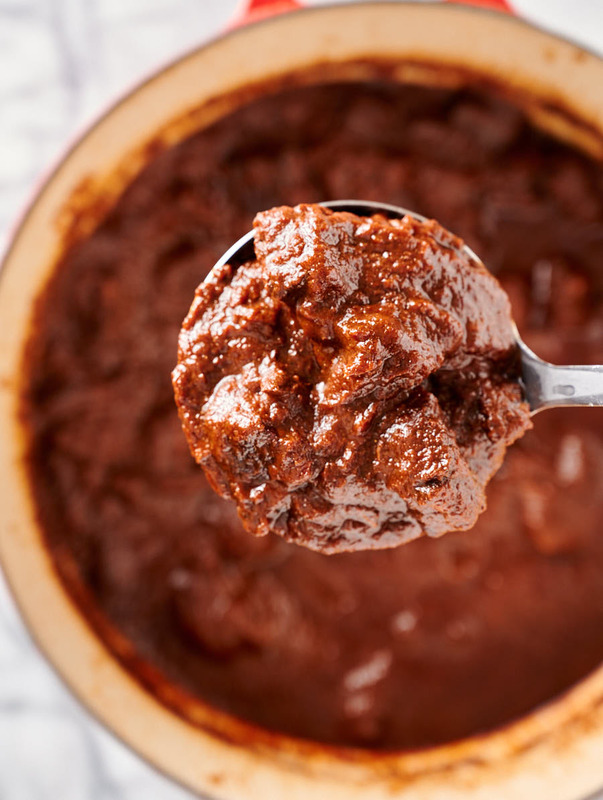 Be ready for chili paste everywhere. Stir and cover. Every minute or so uncover and give it a stir. After 7-8 minutes turn the heat off. Remove from heat. Let it sit a couple minutes to stop frying (and spraying everywhere). Take the lid off the pot and add in the beef and accumulated juices. Stir to combine. Bring to a simmer. Cover and place in a 325F oven. 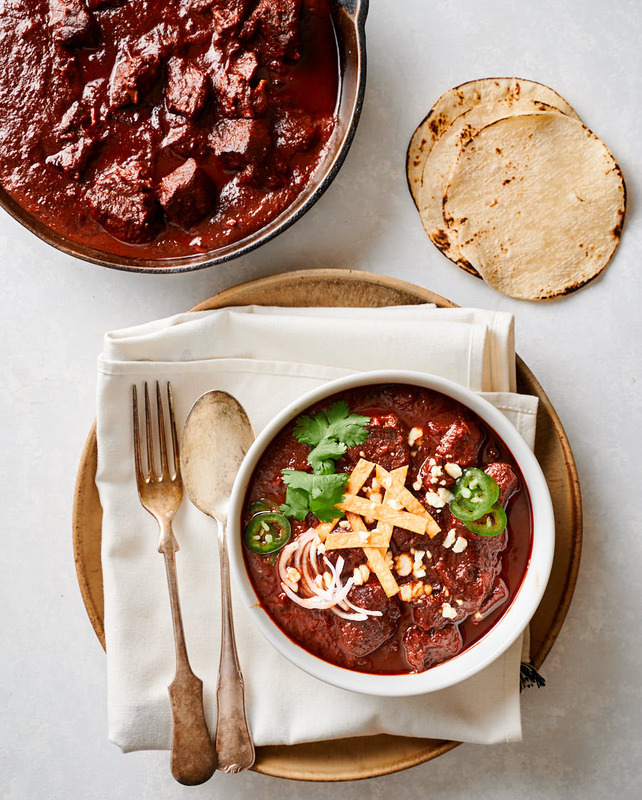 Every 30 minutes or so give the chile colorado a stir. It's done when the beef is tender. That takes time. Start checking after 90 minutes or so. It will dry out a bit over time so add water as needed. This can take up to 3 hours depending on how big your beef chunks are. When the beef is tender it's time to eat. Taste and adjust salt as needed. You probably won't need a lot. Let it cool slightly and serve with pinto beans and rice. You can garnish with green onions, cheese, sour cream - what ever you want. Tortillas on the side are a nice addition. A little lime to brighten the flavours can be a nice twist to mix things up if you like. In beef, meat, mexican. Bookmark the permalink.